This simple, sweet book is among those picture books that have appeal for very small children as well as younger elementary-age kids. The spare text and bold ink-and-watercolor illustrations combine to tell a story with a theme that all readers will have personally experienced. Bear is in his first year - so everything is new to him. All is going well, until he sees an orange leaf fall from a tree. "Are you okay?" he wonders. More and more leaves fall, all over his island, and he is very concerned about this new development. 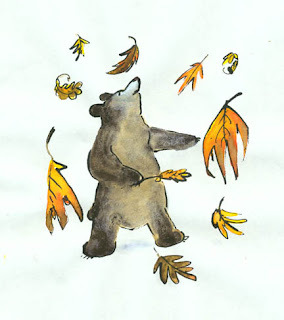 He gathers up the leaves and tries to reattach them to the branches (spearing them on the ends of the twigs, which made my daughters giggle) - "But it was not the same." He watches them come down and down, finally sitting down and glumly giving up on it all, and then he feels sleepy. So he takes the leaves, packs them into a hole all nice and comfy, and settles in for the winter. The readers see the winter come, but bear is snugly asleep in the hole, unaware of the snow drifting outside, and of it melting away as spring draws near. Watching him wake up so joyfully to the spring made us all smile. 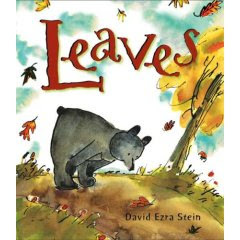 This would be a great book for preschoolers learning about seasons, but it also has appeal for older children, who can empathize with the difficulties of learning about the way things work the first time around, as well as with dealing with the inevitability of change. Publisher recommends for ages 4 - 8.